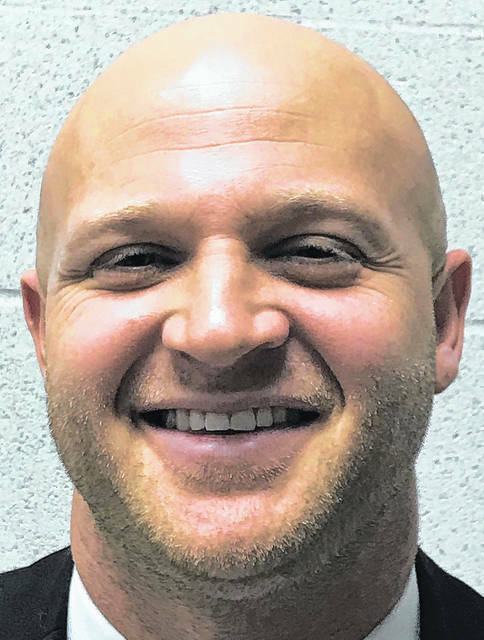 HARROD – Wesley Schroeder is ready to take Allen East football to the next level after being hired Wednesday by the Allen East Board of Education. Schroeder, who has been an assistant coach since 2008, takes over the head coaching duty chores for the first time and is excited about the prospects this new venture brings. Schroeder takes over for Mike Abbey who stepped down in December after seven seasons at the helm. Abbey compiled an overall record of 24-46. The Mustangs went 2-8 mark last year. Schroeder said he was attracted to Allen East for a variety of reasons. Schroeder added that playing in the NWC is also a draw. The Leipsic high school graduate earned his bachelor’s degree at the University of Findlay in 2009 and received his masters of arts from Bluffton University in 2017. Schroeder’s first coaching experience came at Leipsic where he was the quarterback coach and the junior varsity head coach from 2008 to 2011. He then spent four years at Lima Senior as the wide receivers coach and the junior varsity offensive coordinator from 2012 to 2016. In 2016, Schroeder became the the wide receivers coach and varsity co-offensive coordinator at Olentangy Liberty High School. Schroeder makes the analogy of being a quarterback who either starts right away and takes his licks or waits his turn for the right opportunity and he felts this is the right time for him to become a head coach. Team first is how Schroeder approaches his new coaching gig. The first order of business for Schroeder will be to meet with the players, followed by forging a coaching staff and then integrating his style to the Mustang football program. In other coaching news, Bath will be hiring Bryant Miller as the new head football coach on Jan. 16 according to the Bath Athletics twitter feed. Miller graduated from Bath High School in 2000. Allen East has hired Paul Patton as its varsity coach. He replaces Bill Mattevi who resigned to take over as Director of Operations at Allen East. Patton’s coaching career started in 2006 at Perry High School where he remained until 2013. At Perry, he won the Northwest Central Conference title in 2010 and was district runner-up in 2009, 2010 and 2011. For the last two years, he has coached at Upper Scioto Valley. His overall coaching record is 99-71. Allen East has tabbed Leah Sanderson as its new varsity coach. A long time art teacher at Allen East, she replaces former coach Dana Houston. Though never a head coach, Sanderson is an experienced runner and often competes in distance races, including marathons. She will bring experience and distance running knowledge to the program and hopes to improve the female numbers in a program that has several returning male runners as well as boys and girls running for the junior high. This entry was tagged alleneast. Bookmark the permalink.